I think I may have found my new favorite miniature wedding favor! Check out these mini oil and vinegar bottles! If you’re a foodie or if you just want to give your guests something really, really unique these win the day. 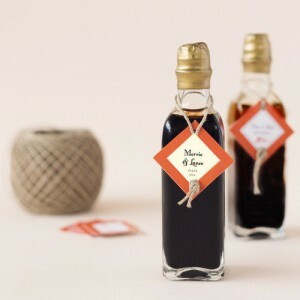 We’ve featured a lot of mini food favors here, but mini bottles of oil or balsamic vinegar are a great idea! The best part about these mini bottles? You can choose what they’re filled with. Choices include aged balsamic, olive oil and balsamic duo, extra virgin olive oil, pepperino oil, and more. These are not cheap favors either – they’re priced at $6.56 a bottle and you need to order a minimum of 12 bottles. If you’re hosting a small reception these would be ideal. For added fun you can also choose to add a personalized tag to the bottles. You can find out more about these mini favors here.